Don’t walk, boogie instead! The glitter ball is ready so let’s go back, right back to the decadent age of disco! A funktastic live band keep the beats pumping & the rhythms rolling. 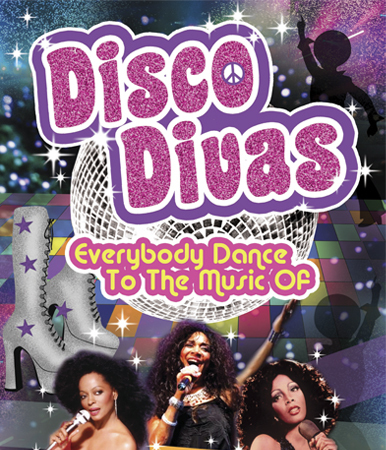 A fabulous cast of world-class singers perform the greatest hits of the glamorous high priestess of Pop, Diana Ross, Joni Sledge and the undisputed queen of disco, Donna Summer. This divatastic show features many of their classic hits, ‘Ain’t No Mountain High Enough’, ‘Last Dance’, ‘Frankie’, ‘I Feel Love’, ‘Chain Reaction’, ‘Upside Down’ and many, many more. Put on your platform shoes, grab your funky Afro wigs and your flares, and let’s dance!